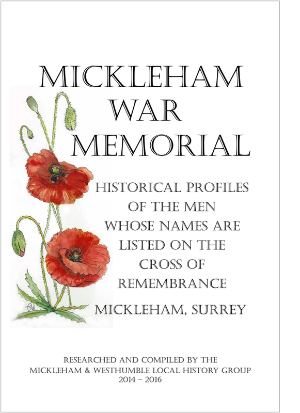 The Mickleham & Westhumble Local History Group have produced the following booklet. Please click on the image to read. Mickleham War Memorial The Mickleham War Memorial is in the Churchyard of St. Michael's, Mickleham. It contains the names of 11 men who gave their lives in the Great War and 11 men who gave their lives in World War 2. We have produced an illustrated booklet containing information about the War Memorial including profiles of the 23 men listed on it. To view this please click on the link below..